The Cargill Coop Academy provides cocoa farmer cooperative executives with the management skills to make their organisations more professional, efficient and successful. 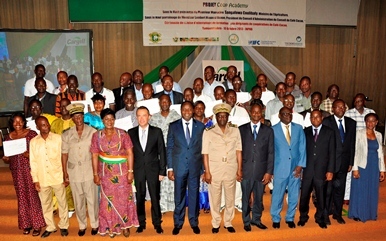 Abidjan, Côte d’Ivoire – 23 October 2013 – Cargill has established the first business skills program for cocoa farmer cooperative executives in Côte d'Ivoire with the launch of the Cargill Coop Academy. The program, which is new and unprecedented in the cocoa sector, is the latest initiative under the Cargill Cocoa Promise and provides cooperative leaders with the management skills to make their organisations more professional, efficient and successful. The Cargill Coop Academy provides cooperative managers with 28 days of intensive training, followed by a year of personalized and on-the-ground coaching. The program includes training and support around good governance, the structure and principles of a cooperative, people management skills, improving operational management, enhancing financial and auditing techniques, and developing business and marketing plans. 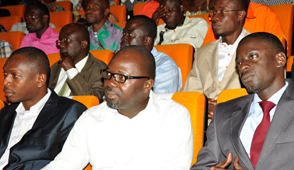 Recent cocoa cooperative executive graduates at a graduation ceremony in Abidjan. The graduation ceremony was attended by Mr. Mamadou Sangafowa Coulibaly, Minister of Agriculture of the Republic of Côte d'Ivoire. The Cargill Coop Academy has been developed in partnership with TechnoServe, a non-profit organization that develops business solutions to poverty, and INPHB (Côte d'Ivoire’s leading university), and is supported by the International Finance Corporation (IFC), The Sustainable Trade Initiative (IDH) and Emerging Leaders, an NGO focused on bringing leadership training to farmer communities. Under the Cargill Cocoa Promise, Cargill invests and provides financing, training and support to secure a sustainable cocoa supply chain in cocoa producing countries including in Côte d'Ivoire, Ghana, Cameroon, Vietnam, Indonesia and Brazil. For more information, visit http://www.cargillcocoachocolate.com.